It is said that Tibetians prefer turquoise to any other gemstone and that virtually everyone in Tibet possesses some turquoise - they believe it will bring them good luck. While I can't guarantee this one-of-a-kind Tibetan inspired necklace will bring you good luck, I can guarantee that it will bring you compliments for your bold style and discriminating taste. This necklace is 16" without the pendant and 22" with the pendant - a 45mm Chinese turquoise donut with beautiful black inclusions. 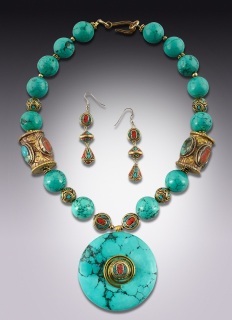 Fourteen 18mm turquoise-dyed howlite rounds with similar black inclusions complement the pendant. Two 1-inch traditional Tibetan cylindrical beads inlaid with coral, sliver plated brass and turquoise, and seven 8mm Tibetan round beads with turquoise, coral, brass inlay establish the Tibetan inspiration. The necklace is finished with an 18mm brass toggle clasp. The earrings are an added feature to this set. 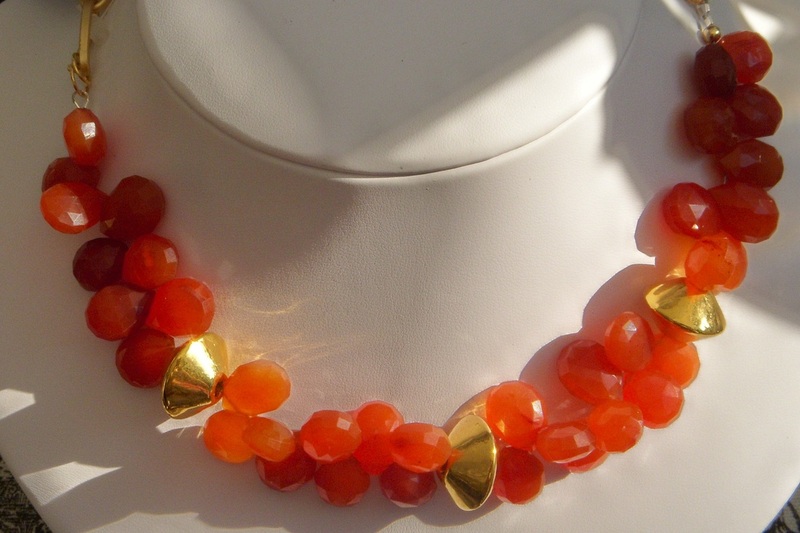 exquisite natural faceted carnelian briolettes arranged between three geometrically shaped goldtone ceramic accents from Mikanos. The carnelian is A grade and the color is spectacular! The 18" necklace is finished with rectangular matte-finish gold link chain and a 14mm goldtone toggle clasp. Elizabeth Taylor's Cleopatra and the widely traveled King Tut's Treasures exhibits in museums all over the country. This one-of-a-kind necklace celebrates the Egyptian Revival style with its bold colors, large scale, and dramatic design. complimentary orange flowers, and eight Carnelian rondelles. 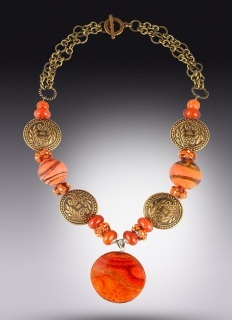 Double strands of brass chain and a brass toggle clasp completes this beautiful design.